COADE HOUSTON, Texas, January 9, 2004 - COADE, Inc. has released PVElite Version 2004, an updated edition of the company’s popular integrated vessel design and stress analysis software that incorporates the latest ASME 2003 Addenda for pressure vessels and the new European vessel code EN 13445 and adds direct, integrated graphic input for complete heat exchanger models and other enhancements. In PVElite Version 2004, heat exchangers can now be graphically constructed from their individual components and submitted as a unit for pressure design or evaluation. All the individual calculations for heat exchanger components previously available are now integrated to simplify modeling and reduce repetition. 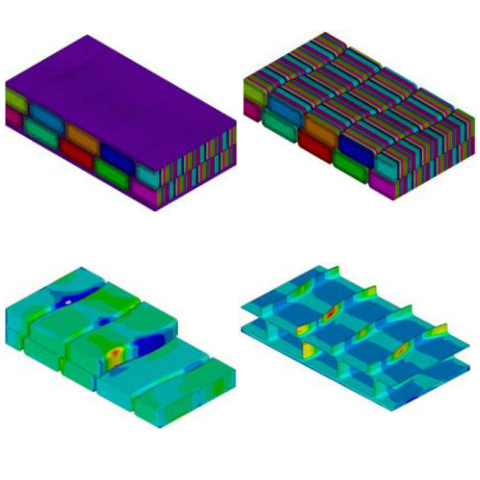 The software analyzes required tubesheet thickness, flanged extension thickness as well as calculates tube and shell stresses and expansion joint stress. By adding the EN 13445 code, PVElite now incorporates many requirements for the new European standard for vessel design just as it does with ASME Section VIII and PD 5500. Among these are rules for thickness due to internal and external pressure, nozzle reinforcement and conical section calculations. PVElite Version 2004 also adds an updated materials database, integrates Appendix EE for half-pipe jackets and Appendix 14 for large central openings and includes the Mexican wind code. The new version also allows the user to add materials to the 5500/13445 materials database and to check for build updates automatically on the web, warning if the software version is out of date regarding codes and other additions. Other improvements include an enhanced output processor, more flexible nozzle analyses functions, and the addition of the PD 5500 Enquiry Case for computing maximum forces and moment for nozzle connections. In addition to these enhancements, PVElite incorporates current pressure vessel codes and standards such as ASME BPVC, PD 5500, ASCE #7, Uniform Building Code (UBC), National Building Code (NBC), ANSI B16.5, TEMA and WRC Bulletins 107 and 297. PVElite provides engineers, designers, estimators, fabricators and inspectors with complete design of tall towers, horizontal vessels, "pots and pans" and individual vessel components. The software was designed for quick start up, and its graphical modeling capabilities are easy to use and allow for quick data assembly and vessel analysis. As is the case with all its software products, COADE has tested PVElite using its stringent quality assurance (QA) standards and backs the software with a trained team of software engineers and program developers. COADE, Inc. is one of the world's leading providers of engineering and design software designed for cross-discipline information sharing and interoperability. Company products include CAESAR II, the world's most popular pipe stress analysis software; PVElite and CodeCalc, pressure vessel and component design and analysis software programs; CADWorx, an integrated series for process plant design; and TANK, comprehensive engineering software for designing and analyzing oil storage tanks according to the latest API codes. COADE, CAESAR II, CADWorx, PVElite, CodeCalc and TANK are registered trademarks or trademarks of COADE, Inc. Microsoft Access is a trademark of Microsoft Corporation.